The Bar Graph Report is a quick, simple, and familiar-looking report of your survey results. While this report displays frequency in bar graph format by default, the appearance can also be switched to display data in other charts and graphs as well. On the Report menu bar, click on Frequency and select Bar Graph. Select questions you wish to add and click on Continue. Click on Generate to create the report. To modify a generated report, clicking on ‘Modify Report’ redirect you to the first step of the report wizard. Properties and Filters: Even after the report is generated, properties and filters may be modified from this section. You can edit, remove, or add the field which you want in the report by clicking on the Edit icon. 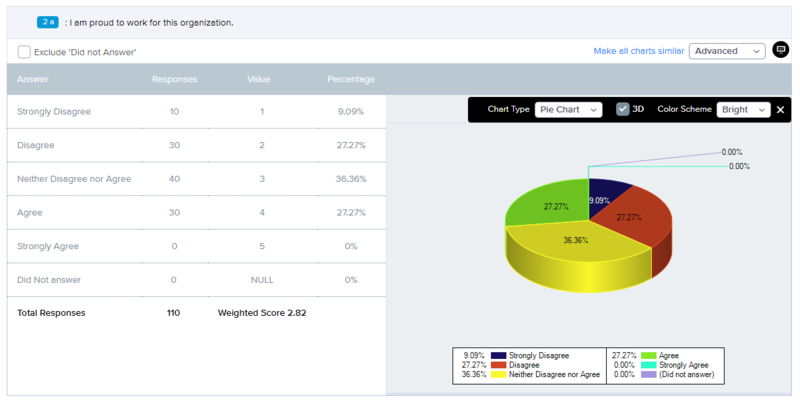 Under the Report tab, select your survey and choose Bar Graph. Follow the wizard to generate your report. To modify a basic chart, switch from Basic to Advanced in the top right corner. Then use the Chart Type dropdown menu to make your selection. As desired, you may also choose your preferred colors from the Color Scheme dropdown. The following examples illustrate variations in graph type and color scheme. Pie Chart in 3D with color scheme as Bright. Area Chart in 3D with Autumn as color scheme. Cylinder Chart in 3D with WarmEarth as color scheme. Clicking on ‘Make all charts similar’ will apply the current setting for that particular question to all the questions of this survey.